Rugged vinyl carrying case will hold any APH Pocket or Postcard Slate. Second pocket holds two styluses or wooden erasers. Flap seals with hook/loop material. Belt loop and holes that fit a 3-ring binder. Measures approximately 3 1/2 x 9 inches. Slates and styluses sold separately. 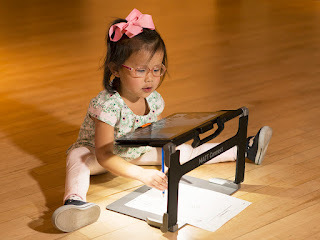 Click this link to purchase the SlateHolder from APH.